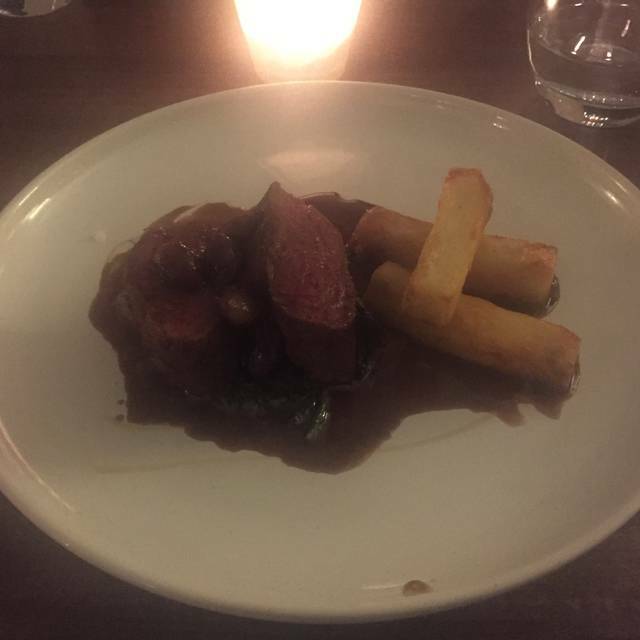 Rascills is a quality, standard driven restaurant which is fully independent, owned and operated by husband and wife team Richard & Lindsey Johns. The two bring a wealth of experience in hospitality having previously owned Artisan restaurant, Hessle, East Yorkshire for nine years. Through sheer hard work and dedication critical acclaim followed gaining many accolades along the way. It’s a shame this was their last serving and I only visited twice before they closed. The food is beautiful. It’s in a lovely rural location. How they manage to do all they do with just the 2 of them is a wonder and a credit to them both. I convinced my husband to try the pork as he gets very upset if the crackling isn’t up to scratch thankfully he was not disappointed!!! Otherwise it would have been a long drive home. My beef Sunday dinner was delicious and the profiterole dessert was spot on! Absolutely fantastic visit. Couldn’t fault the venue, the food or the service. Fine dining at its best. Took my husband and my father in law and they both throughly enjoyed themselves, was concerned they might not enjoy the menu as it was a set menu, but they loved it. A lovely meal with great friendly service, we'd gladly return. Food was excellent and service very attentive and friendly, it’s amazing to think that the couple who run this do it all on their own!! I shall most definitely be keeping my eye out for what they do next! Can’t wait to visit again for Sunday dinner. really nice setting up a small lane opposite a field and fairy lights inside. makes it look very pretty and charming. small restaurant with exceptional attention to detail with the service. felt very looked after and appreciated. We have been meaning to visit Rascills for months and eventually managed to get there. It exceeded our expectations in every way. From the genuine warmth of the service, the ambience and the stunning food we had an amazing evening and will definitely be back. This was our second visit and we brought two family members. We were warmly welcomed by the owner. The food was excellant in a nice relaxing environment. Would've definitely recommend a visit. From entering the restaurant the service was outstanding from this husband and wife team. Great wine choices and non alcoholic options. Small and cosy restaurant. Everything that came from kitchen was exceptional quality, well presented and full of flavour. Paired wines were also available for each individual dish. Having enjoyed dinner so much, decided to try lunch. The same excellent service, lovely food and 'just right' portion sizes at a very competitive price for the quality. Wow fantastic welcoming service from Lindsay throughout with quality cooked food beautifully presented from Richard . Well worth the drive and highly recommend. Fabulous food & wonderful service. Husband & wife team make it a friendly home from home place to visit with excellent food & company to boot. Rascills was fantastic. The service was faultless and the food amazing. We will be going back. An excellent evening dining experience with attentive service and delicious food. A small gem of a restaurant but nicely set out to provide an intimate atmosphere. Although a set menu the choices made and the quality of the cooking were exceptional. To round off a thoroughly pleasant evening our host brought us a complimentary liqueur as it was my birthday! The food and service was great, the host was very personable and friendly yet professional. The only downside would be the general ambiance and surroundings, the bar area, outside space felt a little like you were being hosted in someone’s home and the restaurant had a cafe feel to it. Excellent food, friendly service, good value for money. The food and service was of the highest standard. We will be back. Great food. Superb friendly service. Lyndsey our host greeted us very warmly, had a great conversation with her, which included a little local information. We were served a very nice bottle of red and enjoyed the surroundings before we were shown to our table. Lyndsey and Richard have done a great job in creating a lovely ambiance,which was not spoiled by the fact we and another table of 4 were the only diners for the evening. The food is wonderful, and they were happy to cater for me, a non red meat eater. This was by prior arrangement. I truly hope that this restaurant is recognised for its quality of food and service. Richard is obviously a talented chef. The location is lovely ,although not able to enjoy the outside space in November, would love to go back in summer. The fixed menu, sort of "taster" but more substantial whilst great, may be a little limiting for some, although I am told this changes frequently. A lovely experience we will be repeating. We had a superb meal in this delightful intimate restaurant. The food was delicious and enhanced by the suggested wine pairings. We started our set meal with the most velvety and moreish of butternut squash veloutes: this was followed by scallops served with some beetroot - an unusual but tasty and balanced combination. 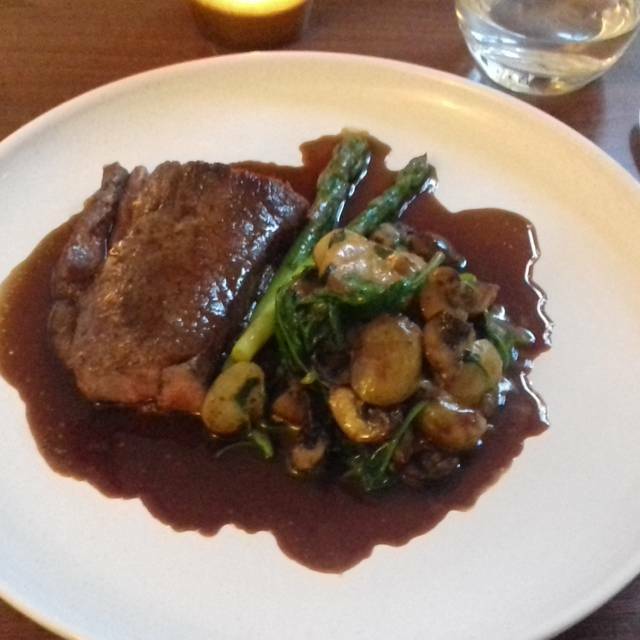 The wild mushroom risotto was rich and flavourful and the steak was perfectly cooked and as for the chips - just so tasty, crisp and melt in the mouth! The sticky toffee pudding and ice cream did not disappoint either! If you live between York and Northallerton and haven't yet dined at Rascills, you are missing out on a local gem. Rascills has recently been listed in both the Michelin and Good Food Guides 2018 and for good reason. A meal here is strongly recommended! Excellent, high quality food. The menu is a set menu but don’t let this put you off, all the courses are delicious and if you have any special requirements these can easily be requested in advance. Front of House is very attentive and you are very well looked after. Well worth a visit. We are so lucky to have such a fabulous restaurant on our door step. Run by a couple who are passionate perfectionists the whole dining experience is a delight from start to finish. Small but creative menu with fresh local ingredients cooked to perfection. An excellent wine list and cocktails, Rascills is a great place to eat what ever the occasion. Sunday lunch is particularly good value. The 5 course no choice menu is excellent quality, starting with a silky veloute, taking in very tender delicious local lamb and with the final desert course made up of 3 separate deserts they could call it an 8 course menu if they separated them out! Faultless. Beautiful food and warm and friendly welcome. Would highly recommend. We had a very nice meal at Rascills. Lindsey was a fantastic host and the format of the meal was excellent. We had home made cheese straws with our drinks before the meal. We had a vegetarian in our party and Rascills put together a separate menu especially for them. The meal itself was top quality. We would highly recommend a visit to Rascills. This fine restaurant is tucked away down a short lane in Typical North Riding village near several areas of outstanding natural beauty. It is well worth the effort to seek it out . We were immediately made very welcome and had a pre dinner drink in the well stocked bar. The dinning room was modern with well spaced tables. The wine list was short but had great range of wine for every taste and wallet. Our four course meal was preceded by a complimentary exquisite pumpkin veloute. Each course was designed to compliment each other and were very tasty. There was a choice of a trio of desert or cheese as final course. I am glad we both chose the desert as mine was so good I didn't want to share. The passion fruit sorbet and lemon posset were devine. We shall be back. We had a fabulous evening down at Rascills - food, service and wine were all impeccable. Thoroughly enjoyed our night out! We had a lovely meal at Rascills - it turned our meal out into a brilliant evening. From the moment we were met at the entrance until we left we felt looked after and entertained. The bar and eating area are delightfully decorated and it has a lovely feel - it just seems right when you enter. There is a set menu for the evening so make sure you are happy with this before booking. Each course was beautifully presented, carefully described as it was served to you and importantly really tasty. We couldn't believe how much time had passed while we were there - this is not a criticism we really enjoyed our evening, feeling relaxed, never hurried but also never feeling like we were waiting a long time. There is a nice choice of wines by the glass as well as by the bottle. This is not a cheap evening out but we both felt it was well worth the money and we will return. Excellent meal. Food of the highest quality and at reasonable price (it would be a lot more for this quality food elsewhere). Very friendly welcome and we were well looked after. Well worth the visit. Serious food, and must be best restaurant for miles. Very friendly service, and pleasant ambience. Already recommending to friends, and will revisit.